So what can go wrong? Skin infections with Staphylococcus and Psuedomonas, cellulitus, fungal nail infections, ringworm, warts, nail loss, bacterial nail infections, and abscess just to name a few. Diabetics, people on cancer medications, and patients with poor or decreased lower leg circulation have a higher risk of poor would healing and increased infections. If the person who sat in that nail salon’s fancy spa throne chair with the built in massage features before you had athlete’s foot, you have a reasonable chance of picking that up too. While some salons are up to date with required antiseptic procedures, the majority are not. Many salons may fake antiseptic procedures by having a jar of blue antiseptic on their counter but never putting any instruments in the fluid. Or if they do put the instruments in the antiseptic fluid, it may not be for any adequate amount of time. Some salons have been found to use Windex window cleaning fluid in these jars instead of the required more expensive medical grade antiseptic fluid. We highly recommend purchasing a quality set of personal nail files, cuticle push-back, nail clipper, and buffer to take into your nail salon. • Purchase a quality set of nail files, cuticle push-back, nail clipper, buffer from Target, Sephora, or your local drugstore. • Take your own nail instruments and files to the salon. • Insist on a disposable liner in soaking tubs. • Keep fingernails short and clean. • Gently push back cuticles after a nice soak. • Gently file down heel calluses with emery board or pumice stone. • Walk away from a nail salon if it does not’t look right. • Apply a good moisturizer like Cutemol, Aquaphor, Vaseline, or Crisco Vegetable Shortening to cuticles. • Clean any cuts or abrasions with hydrogen peroxide and apply Polysporin or Neosporin. 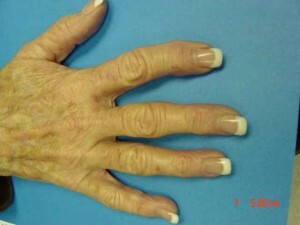 • See your physician or dermatologist for discolored or thickened nails, or other skin infections. The Skin Center at Laguna | 26081 Merit Circle Suite 109, Laguna Hills, CA 92653 (949) 582-7699 or (949) 582-SKIN Copyright © 2000-2011 The Skin Center. All rights reserved. U.S. Board Certified dermatologist Dr. Gary Cole, Dr. Nili Alai, top dermatologist and best dermatology skin surgeons serving Orange County, Laguna Hills, Mission Viejo, Lake Forest, Foothill Ranch, San Juan Capistrano, San Clemente, Talega, Dana Point, Monarch Beach, Laguna Beach, California. The Skin Center is a full service Orange County dermatology office that practices excellence in medical, surgical, cosmetic and pediatric dermatology. Dr. Alai and Dr. Cole are Board certified Dermatologists.